Trend following strategies did a good job timing the markets during the 2008 crisis and continued to work well in the recovery 2009. For the subsequent years, these systems seem to have failed amid political influence on markets. Blind faith in optimized and complex systems is dangerous. We are convinced that more robust trend following approaches offer added value. Robustness is achieved by making the right assumptions and by trend classification. Besides looking at calculation methods, we also examine capital flows and especially behavioral market patterns. Numerous trend following strategies survived 2008 very well and protected investors against the major losses from diving stock markets or any other risk asset class. Some strategies even delivered positive returns. After also profiting from the 2009 recovery, not many investors remained unconvinced of that investment style. However, in the following years 2010 to 2013, especially 2010 and 2011, trend following and market timing approaches seem to have lost their glory. Influence from politics on financial markets is often mentioned as the reason for the failure of trend systems. Uncertainties about the Eurozone and many emergency summits lead to rapid decision making that forced up and down markets. Nearly at the same time, new academic studies and papers from closely followed market participants on the advantages of trend following made the rounds. In particular, the performance figures for momentum strategies were impressive in terms of return, risk and consistency, bringing even more attention to the investment style. It is well imaginable that smart market players anticipated the herd instinct at important market levels to exploit the movements to their benefit, and as a consequence some trend following systems lost their strength. It is secondary to evaluate which factor was responsible for diminishing success of trend following strategies in the past years. We are convinced that trend following still offers a solution to profit heavily from the major market movements. We present a trend model that aims to be very robust by utilizing the right assumptions and through classification of trends. We take a look at a widely used strategy to illustrate problems of trend following in the past that might continue into the future. A common indicator utilized for market timing is the 200 day moving average. We will see that this approach had relatively modest setbacks compared to more optimized strategies. Those that incorporate many indicators or in general rely on a complex network of interdependencies, adjustments and implicit assumptions had more problems, up to negative returns, in the last few years. With the 200 day strategy you are invested in the market as long as the closing price of a selected index is above its 200 day moving average. As a proxy for the broad equity market we take the S&P 500. This simple trend following strategy delivered 7.6% annually in the last 20 calendar years, beating the index by a slight margin. In 2008 and 2009, the index showed a negative return of 24% while the strategy did very well with positive returns of 14%. In the subsequent two years the picture reversed. The market returned 13% but the 200 day strategy lost 2%. Since 2008 there was not one year with outperformance of the strategy against the market. The selected 200 day input parameter already did a much better job than the also commonly used 40 day average, for example. 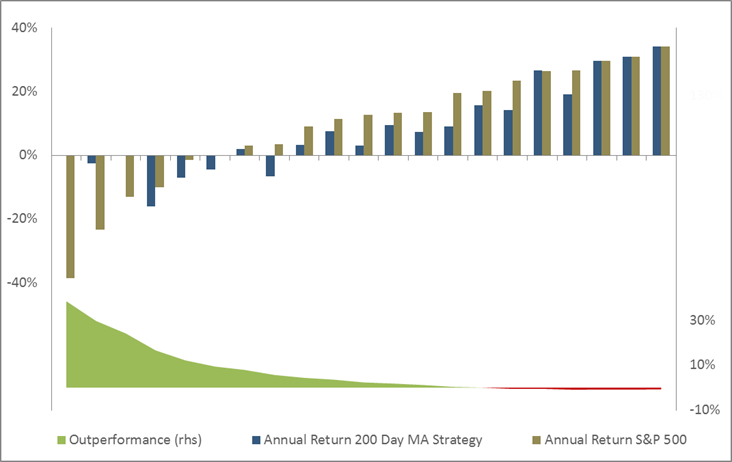 In years with negative index returns, the 200 day strategy achieved a significant outperformance of 7% on average. The three worst single years for the index are outstanding. The strategy only lost 0.8% compared to a loss of more than 20% a year for the market. This is very satisfying and one of the main attributes investors search for – strong protection against losses during the worst market periods. Beyond, the 200 day strategy managed to reach market returns in the best three years. Very good characteristics for the most extreme years are provided but there are fourteen more years. In these “normal” years the strategy underperformed by 6% on average. We aim to keep this well-functioning protection against the worst years but also maintain a higher share of outperformance throughout the normal years. The indication is promising. The simple strategy seems to have failed in those negative years which brought no major damage. The highest observed annual loss for a passive investor in the market during those years would have been about 10% while the average would have been a loss of only 5%. Not really severe drawdowns for a stock market investor. This observation is not the only reason we are convinced that protection measures are not needed for such interim lows. These small downward movements are accepted by investors and in addition, there are other ways and instruments to reduce such interim losses. The goal should have become clear by now. In the worst market periods only a modest part of the market dive should be captured or a fast recovery of losses should occur, aiming to be invested in the market for the maximum time possible. The idea behind using trend following for timing the market is not to blindly trust in a seemingly perfect indicator (system), even though it might have been successful for many years. The 200 day moving average can be counted as such an indicator. Rather, priority should be to correctly assess the major market movements. It is not a conflict and also not an argument against the trend following investment style when indicators or entire trend systems fail from time to time. We do not blindly trust in a complex system but instead adjust a rather simple trend concept. This avoids to a great extent the known pitfalls of trend following that entail whipsaw effects or late market entries. The model should be more robust and due to an increased time with market exposure the outperformance from the extreme years should be maintained to a higher degree throughout the normal years. We believe that trend following is a legitimate foundation for market timing decisions in comparison to economic or fundamental models. Those models often leave out information or neglect external factors. Beyond, usually only a fair valuation and the current deviation from it is determined. From experience we know that these mispricings can exist for a long time, particularly since their determination is highly subjective. The goal of investors with stock market allocation is to achieve returns. Returns, first and foremost, depend on the market movement. Therefore, with the robust trend model we stay as closest to price as possible to come to a timing decision, being aware that trend following cannot provide perfect entry or exit signals. We also draw our observations from daily life in which trends dictate (nearly) anything. Weather, continuously increasing life expectancy, and the movement of animals in herds are only a few examples. At the same time, we assume that trends cannot be confused with perfect prediction. Within major trends you see counter trends on a shorter time scale or within an aggregation. Applied on the examples it means cold rainy days in summer, life expectancy of a single person can decrease through an accident, those of a group of people may decline due to epidemics. Most of the time, herds of animals stand unequally distributed on the plain and only move for a relatively short time over long distances together in the same direction. These observations are the foundations to adjust the simple trend concept for behavioral market patterns, capital flows, and anticipation of counter trends. Thanks to these modifications we end up with a robust trend model that stays longer in the market when a recovery is in sight and reenters the market earlier. In general, harmful activities in the portfolio are reduced because relatively small downward movements do not automatically lead to a market exit. Over the 21 year observation horizon in some cases the maximum drawdown of the robust trend model would have had a higher magnitude than the drawdown of the 200 day strategy but recovery would have been much faster. For the robust trend model it took 237 days to recover losses from the worst drawdown while for the 200 day strategy it took more than 900 days. Overall, the robust trend model clearly dominates a passive market investment in years with negative market performance. Furthermore, for positive index years outperformance is generated. Just as the 200 day strategy correctly anticipated the three best and worst years, our trend model does so, too. In the normal years the major difference becomes obvious. The robust trend model creates outperformance on average in those fifteen years which compares very well to the observed underperformance of the 200 day strategy. Looking back at the years 2008 and 2009, the robust trend model would have returned 13% which is slightly lower than the 200 day strategy’s return but clearly higher than the market return. Most important, 2010 and 2011 would have brought 42% utilizing the robust trend model. The passive investment’s performance tag for these two years is 13% while the simple 200 day strategy would have lost money. Solely to exhibit the quality of the signal for timing, not as a use case, both models are compared as long/short strategies. Consequently, when the timing signal determines to exit the market, market participation is reversed and the strategies profit from falling stock prices. It is interesting to see what happens with the performance figures for the 200 day strategy. The aggregate return decreases, volatility goes up and the maximum drawdown gets more severe. This exactly refers to the problem we intend to illustrate. Obviously, market exit comes too early, entry is too late or it just would have been advantageous to be in the market in the meantime. Due to including the short exposure into the assessment, it becomes even clearer that money is left on the table with the 200 day strategy. 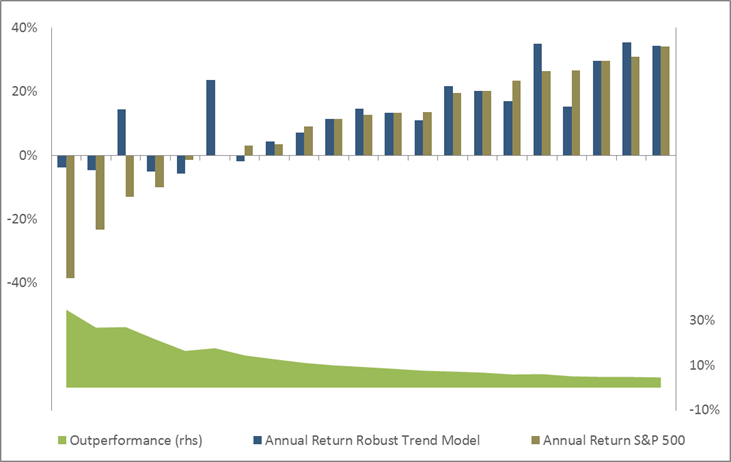 For the robust trend model the aggregate return improves when it is tested as a long/short strategy. Volatility also increases and the maximum drawdown is also more severe. Interpreting the results, the robust trend model does a good job in timing the markets as returns are positive for both sides of market exposure and relative to the index. The number of negative years decreases from five to three. For the short exposure this comes at the cost of higher risk. An improvement could be achieved by more frequent market entries and exits but this is explicitly not desired as we aimed to find a robust solution to capture the major market movements. The most extreme upward and downward markets are well identified by most trend following systems. For the numerous years that lie in between a lot of trend following strategies are easily misled by small movements or short-term changes of direction. Expensive whipsaw effects occur and the strategies often reenter the market too late. For investors, these burdens can outweigh the positive characteristics. Here, the robust trend model offers added value. Thanks to a lower number of market entries and exits in combination with more time in the market, the model reduces adverse portfolio activity, increases return and decreases risk. The presented robust trend model could also be applied as a pure overlay that lowers explicit and implicit protection (hedging) costs and gives underlying strategies more room to breathe. Update: This paper was written and published in March 2014. Tables, charts and the text in the current version are updated with figures for the year 2014. Performance in 2014 for the S&P 500 and for the Robust Trend Model (also the Long/Short version) was 11.39%, for the 200 Day Strategy it was 8.53% (Long/Short: 5.67%).